This isn’t actually a post about transit. It’s about land use. But we’ll get there in a second. Enrique Peñalosa, the former mayor of Bogotá, Colombia, is responsible for one of the most widely-shared quotes in the urbanist world: “An advanced city,” he said, “is not one where the poor use cars, but rather one where the rich use public transport.” The idea is that the end game of “development” isn’t to maximize private resources, but to create such strong public infrastructure that everyone is happy to use it. But what about the opposite kind of city—one where the rich use public transit more than the poor? What can we say about that kind of development? 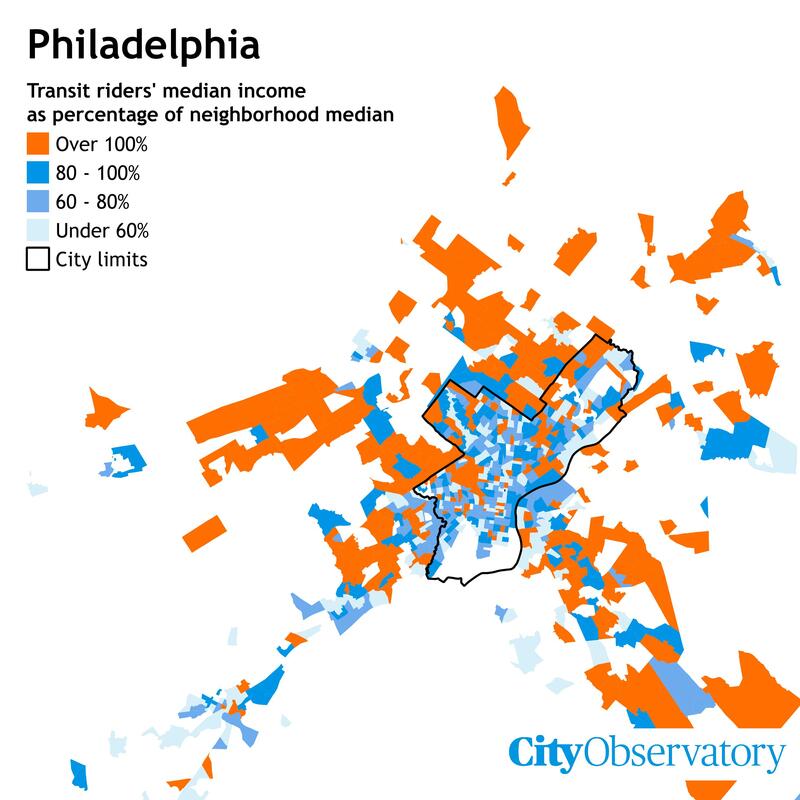 But most of the rest of the region is orange, turning our expectations on their head twice over: not only is it odd that there are places where transit riders are richer than people who drive, but to the extent those places exist, our intuition (or at least mine) would dictate that they would be in central cities, where transit service is very good—in other words, where we come closest to meeting Peñalosa’s vision. Instead, they’re overwhelmingly in the suburbs. Nor is Philadelphia unique. 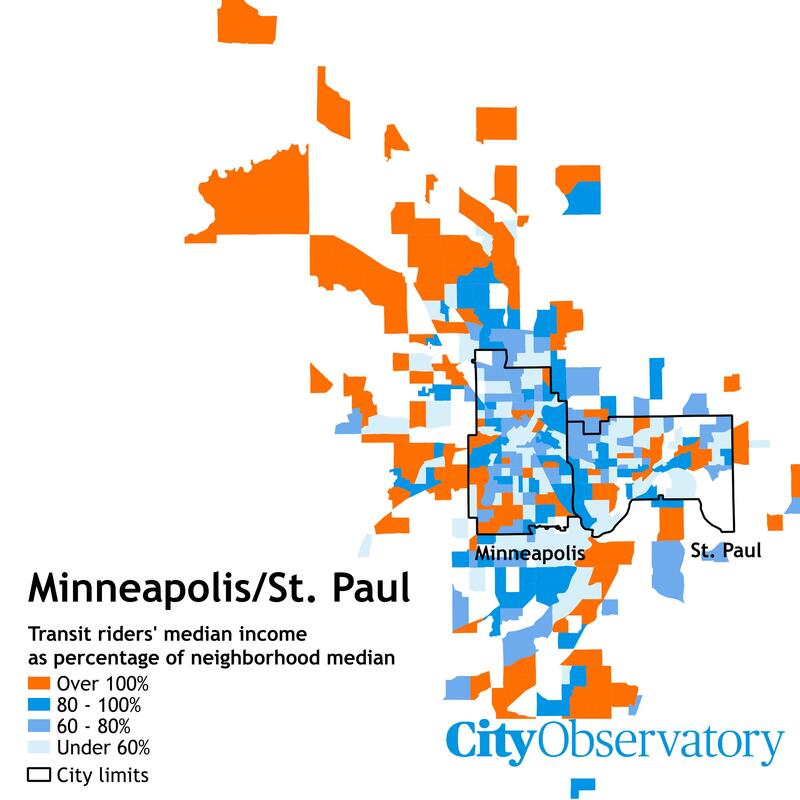 The Minneapolis-St. Paul region, for example, shows a similar pattern. So how do we explain this? Well, here’s where we get back to land use. In America, people with higher incomes tend to have certain kinds of jobs: in particular, white-collar office jobs in fields like insurance, law, finance, and so on. In many American cities, those jobs are heavily concentrated in the downtown core. In cities like Philadelphia, which has an extensive commuter rail network, or Seattle and Minneapolis-St. Paul, which have a pretty good network of regional express buses, that makes commuting from the suburbs quite convenient: You can walk from the downtown station to your office, avoiding both the frustrations of driving in rush hour traffic and the expense of downtown parking. But the situation looks very different for lower-income people. Those jobs are disproportionately likely to be blue-collar manufacturing or service sector, which are much more scattered across the metropolitan area. If you live in the suburbs, the prospect of commuting to another suburb by transit is probably pretty bleak: in most regions, very few suburban jobs are walking distance from a rapid transit station, and local suburban buses are often unreliable and too slow to efficiently travel across the massive distances of American metropolitan areas. Faced with unreliable, extremely slow commutes by transit, most of those blue-collar and service sector workers will just find a way to buy a car and drive—even if it eats into the money they have for other important expenses. And so you end up with a situation where a lot of wealthy people have an easy transit commute to their jobs, but lower-income people do not. Partly, this is a story about how different kinds of transit investments can have very different impacts: building another commuter rail line, for example, versus increasing frequency on a suburb-to-suburb bus. Where are the jobs? Where are the stores? But as I said at the top, it’s really a story about land use. 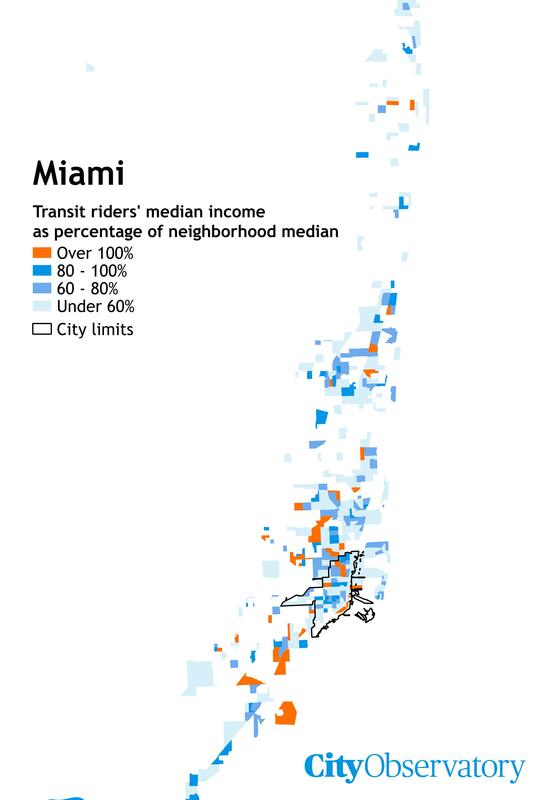 Given the exact same access to transit infrastructure, the wealthy are able to use it more—simply because their jobs are clustered around transit, and other people’s jobs aren’t. Not so much to walk to from here. Credit: Paul Sableman, Flickr. Looked at one way, that’s actually good news: rather than spending years planning and scrounging up money for new transit infrastructure, American metropolitan areas can massively increase the usefulness of the infrastructure they have—and improve their residents’ mobility, both physical and economic—by changing their zoning laws to encourage development within walking distance of transit. A few years ago, a meta-analysis of almost fifty travel behavior studies found that a density of destinations in a central location was one of the most important factors in making transit a useful form of transportation. That applies to jobs, from manufacturing (where possible) to call centers—but since most trips aren’t actually commutes, it should also apply to all the other things people need access to: supermarkets, grocery stores, and homes. In many cases, bringing people, jobs, and amenities closer to transit is easier, and just as effective, as trying to bring transit closer to them.